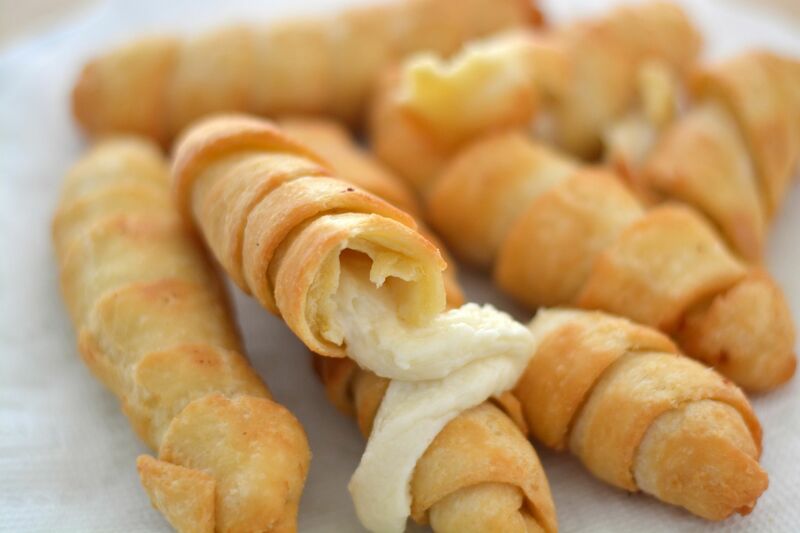 If you love fried mozzarella cheese sticks, you’re going to love this Colombian version, which Venezuelans also call “tequeños”. They’re usually made with cheese for frying or some sort of firm cheese, I often use Mexican queso fresco, then they’re wrapped with a thin strip of a delicious, buttery dough and finally they’re deep fried. Healthy? No. Delicious? Heck, yeah! 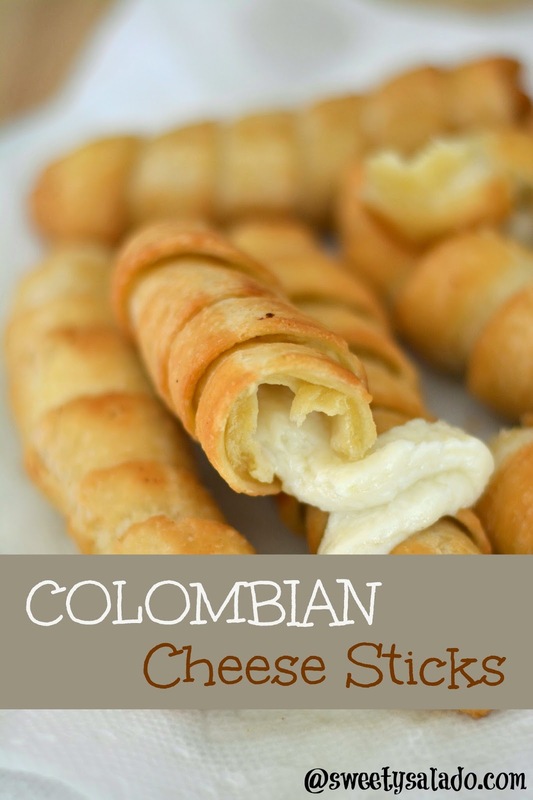 Since I pretty much grew up in the US, I never got to eat these cheese sticks when we lived in Colombia but my husband tells me he used to eat them all the time on his lunch breaks at school. The first time I had them was at a Venezuelan restaurant here in town and even though I thought they were good, I didn’t think they were that great. Then, I made my own version at home and they came out way better! Probably because I make sure that my dough has plenty of butter for it to come out soft and delicious. And, you possibly may be wondering why Colombians and Venezuelans have similar recipes like this one even though we have different names for them. The answer is simple, because we used to be one country until the early part of the 19th century and we still have a lot of things in common, especially when it comes to making yummy food! In a large bowl mix the flour, baking powder, sugar and salt. Then, add the egg, butter and 6 tbsp of water. Stir with a wooden spoon or a spatula and then start kneading with your hands. If you notice that the dough is a bit dry, add another tbsp of water. Continue kneading the dough on a flat surface until the flour is well incorporated and the dough is smooth. Shape it into a ball and place it back in the bowl where you mixed all the ingredients. Cover with plastic wrap or kitchen towel and let it rest at room temperature for 30 minutes. Flatten the dough with a rolling pin on a floured surface until it's about ¼ inch (.64 cm) thick and then shape it into a 10 x 13 inch (25 x 33 cm) rectangle. Then, cut the dough into strips measuring about ¾ inch (1.91 cm ) wide. You should end up with about 10-12 strips of dough. Flatten each strip with a rolling pin once again to make sure is thin enough and to stretch it to about 18 inches (46 cm) long. Then, wrap each cheese stick with a strip of dough starting at one end and ending at the other. Pinch both ends to make sure they're sealed and press the dough with your fingers to make sure there aren't any gaps. Heat the oil in a large pan on medium heat and fry the cheese sticks for about 3-4 minutes total or until they're golden brown on all sides. Make sure to turn them so they don't burn. Take them our of the oil and drain them on paper towels. Serve immediately. You can bake them at 350°F (180°C) for about 5-20 minutes or until they turn golden brown. You can also use mozzarella cheese but they will need to be put in the freezer for about 20-30 minutes (or longer) so the cheese doesn't melt during frying. This kind the dough is puffy pastry? It's kind of similar but not quite since it doesn't have as much butter. However, the fact that you're using butter and baking powder, it gives you a similar texture. Hi Nathalie, try to cover them well with plastic wrap so they don't dry out and then fry them directly from the freezer without thawing them out. The frying time make take a little bit longer, but I think they should still come out great.